Create a different landscape every time with the Blue Ocean Sand Art Picture by Klaus Bosch! 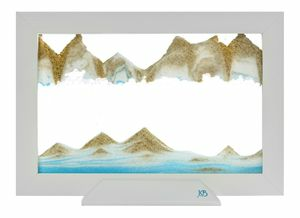 The Blue Ocean Silhouette sand art measures 8.5 x 5.5” and are perfect for the desk at home or the office. They sit in a separate base but can be turned vertically or horizontally. The Blue Ocean is as close as you can get to a vacation on your favorite beach while at the office. Actual beach sands combined with the blue glitter take you away to your favorite place. • Dimensions: 8.5" x 5.5"